Traveler is a mobile AND APPLE WATcH app designed for tourists in San Francisco, so that it may better support THEM iN discovering THE CITY. In this project, I was challenged to create a visually unified brand system for a transportation application. I was asked to define the product’s user interface layout and structure. The goal was to learn how to evaluate designs with people to gain valuable feedback on our product and concept. We selected my existing Traveler mobile app to iterate on, and ensure usability. Tourists can browse popular destinations, local events and the best places to grab a bite. They can then use the app to navigate to their destination along with viewing the best routes parking and bike rental spots in the city. Tourists can get directions and keep up with their travel schedule through their apple watch app. It will prompt them with turn-by-turn directions and inform them whenever they reach their destination. My primary focus was to provide users with a vibrant and memorable experience of San Francisco while navigating through the Traveler app. I reinforced this experience through an energetic color palette and a logo that identified the city and the action of traveling. I experimented different concepts for the home and navigation section of the app. It was important to ideate on the most efficient way for users to navigate and arrive at their desired destination. For the logotype, after several iterations and based on feedback, I landed on a visual abstraction of an important landmark of the city. For our usability testing, we decided to focus on the Traveler mobile app. 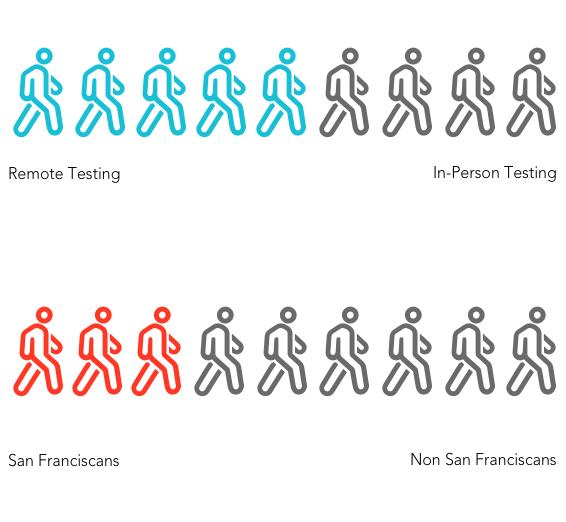 We conducted two rounds of user testing, in the first round we ran 5 usability tests through usertesting.com. In the second round, we interviewed 4 users in person. We focused on how the users interacted with the Traveler app. We questioned if tasks flowed intuitively to be completed and if users were able to get from point A to point B. We synthesized our findings and observations into insights and then used the metrics below to categorize them into a matrix. The metrics helped us organize our findings and record them digitally. We were able to reference it several times while redesigning our flows and screens. This matrix shows several of the insights that we implemented in the redesign of the screens. We chose not to implement changes that were present in quadrant 2 ( Low relevance and high implementation effort) as we felt they did not drastically improve the overall experience. After our second round of testing, we redesigned several screens. Based on feedback from users, we added two new screens and altogether removed the fitness feature. This project helped us understand how to explore user testing methods and how to synthesize a large amount of user feedback into tangible changes that we could implement. Exploring two different user testing methods allowed us to compare and contrast the benefits of each. Usertesting.com allowed us to quickly create and send out a usability test and receive results within a day. On the other hand, the in-person testing which took a lot more time allowed us to get more in depth feedback as we were closely observing the user.